In honour of our brand new Pollogen technology (the ONLY machine in Ireland) we are giving away 3 FREE treatments to enhance your skin, face, and body! Do you have stubborn skin issues, such as loose skin around the jowls, neck, stomach, mummy tummy, cellulite, wrinkles, laughter lines, crows feet, age spots, stretch marks, or acne scars? Newpark Clinic understands your concerns and is happy to offer skin care treatments to give you sensational skin results! The winner of this contest will choose between 3 of our non-invasive and rejuvenating skin care therapies: body tightening and contouring, face and neck tightening, or face volumization (see details on each below). 1. Body Contouring Treatments: This revolutionary technology works on the dermal and muscle layers to remove liquid fat from the body (basically squeezing the fat out). This is a great treatment for someone on a weight loss journey, to help tighten and lift their new body. Improves: loose skin around the stomach, arms, hands, thighs, legs, and ankles, the appearance of cellulite, and love handles. 2. Face Tightening Treatments: The same machine which tightens the body is used to contour the face by removing the liquid fat. Improves: loose skin around the face, jowls, and neck, the appearance of wrinkles, and problem areas around the eyes, lips, and forehead. 3. Face Volumization: The new Surgen machine gives the face a “mini face-lift” effect by resurfacing using hybrid energy (the only treatments offered in Ireland at the moment). Improves: wrinkles, laughter lines, crows feet, scars, stretch marks, acne scars, and age spots. These clinically proven treatments would normally cost upwards of €300, but the winner will receive the 3 procedures free of charge and will see results after the first session. Contest ends November 25, 2015 at 11:59pm. Click the link below to enter and don’t forget to like us on Facebook to receive contest updates! You can receive up to €200 off your Invisalign treatment, if you book your first appointment to begin your Invisalign journey at Newpark Clinic within 1 week after our Open Day! Call (01) 210 4588 to reserve your desired consultation time to speak with our Specialist Orthodontist, Dr. O’Donnell and our Invisalign Representative, Mr. Peter Duffy. Please note this offer is invalid as of 11/11/2015. We are turning a new leaf this Autumn, by revitalizing our skin care clinic! As an added bonus to our newly revamped skin care clinic, we are giving away three treatments for free to one lucky winner! To enter, click here and follow the instructions in the bottom! 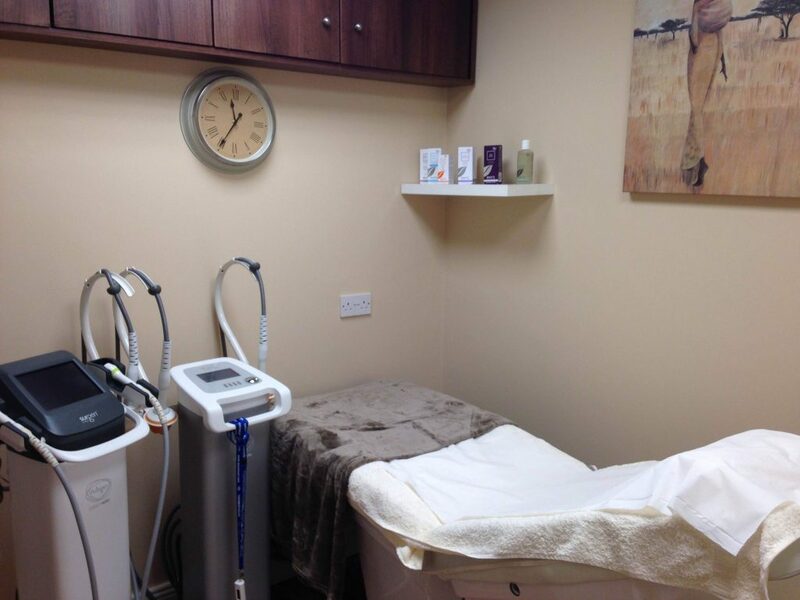 Our skin care room has recently been renovated and ready to welcome patients and put them at ease. The new Surgens breakthrough technology delivers skin resurfacing and volumisation around the face and neck areas. It delivers a “mini face-lift” effect by plumping and rejuvenating the skin. This pain-free treatment produces long lasting results that are instantly visible after the first treatment. Surgen stimulates regeneration of collagen and elastin while smoothing the complexion and reducing the appearance of blemishes and scars.The unique treatment method allows for on-going rejuvenation – so results are enhanced over time and long-lasting! Our Lipofirm Plus delivers tightening effects to the skin around the face and neck areas. This technology works on the dermis, hypodermis (fat), and muscle layers with radio frequencies and dynamic muscle activation to deliver superior, skin tightening results. The same Lipofirm Plus technology that tightens the face, also performs body sculpting, skin tightening, and fat reduction on the body. By “squeezing” the fat out, you can lose centimeters off your circumference after the very first session! It is a great aid for someone on a weight loss journey, to tighten the extra skin and to give extra toning measures to the body. 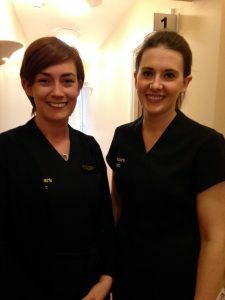 Congratulations to our nurses, Louise and Sharon, who are undergoing orthodontic treatment of their own! Louise (left) has the fixed braces and Sharon (right) has the Invisalign. Charity Raffle Winner Summer 2015! We are very happy to announce the winner of our Charity Raffle this summer goes to Autism Assistance Dogs Ireland! 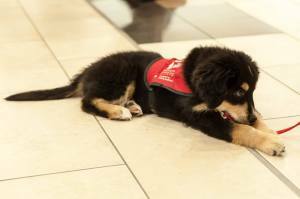 Autism Assistance Dogs Ireland is a national charity providing highly trained assistance dogs for children with autism and their families. Their dogs are specially trained to provide safety, independence and companionship to children who would otherwise live in a very isolated world. These dogs help to transform the lives of children and their families. We are so happy to donate to such a wonderful and fuzzy cause! Please feel free to check out their Facebook and webpage to see what you can do to!